Can Africa And India Work Together? 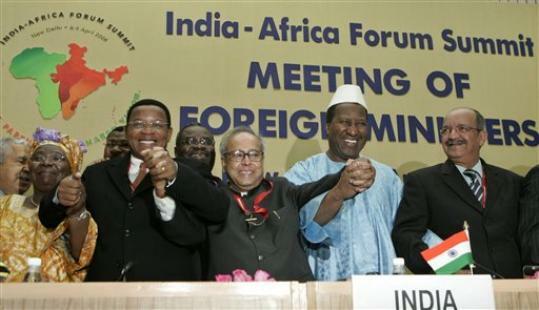 In 2007-08, Africa finds itself at the centre of attention in India. A convergence of social forums and summits, research reports and civil society mobilisations have hoisted the needs and challenges of African countries visible on the political agenda, both at the national level and within different constituencies. Three initiatives are pivotal in this plethora of African activities: the recently-concluded India-Africa Forum Summit, the World Social Forum-India’s events in 2006-07, and the ‘Focus Africa’ along with the Team Nine activities, in the early years of the decade. poses fundamental questions about the relationship between the powerful, rich, industrialised world and the poor, developing countries. ‘Africa’ has been endlessly recreated and deconstructed, used and abused by the State and the market, by popular and elite discourses on the nation and the people that were to be created and moulded in the New World and, last but not the least, by progressive and conservative politics. For analytical purposes, three periods can be identified in India-Africa relations in modern times, each corresponding to different levels of political and economic developments in India, and integration of the Indian population into the African economy and politics. The first period began in the era of imperialism during the 1900s, when Indians got deeply involved in Africa: from Indian capitalists, especially from Gujarat who traded with the continent, to the Indian troops, who were part of the British colonial ventures. Other than Mahatma Gandhi’s long sojourn in Africa, and some other Indians’ contribution in the political awakening of the region, Indian-African relations were shaped by an economy and society which was highly exploitative, unequal and hierarchical. The second period started with the politics of decolonisation, followed by the newly independent Indian and African nations, often displaying an emphasis on modernisation, technological cooperation and scientific progress. Jawaharlal Nehru’s speech, delivered at the concluding session of the Asian-African Conference (Bandung, Indonesia, April 24, 1955), richly captures this aspect of decolonisation and development between Asia and Africa. The third period spans the corporate globalisation from the eighties to the present day, when big Indian companies and private capital and their trade and investment in Africa has became the prime engine to drive India-Africa relations. This historical journey has had many deficits. For example, people-to-people contacts between India and Africa have hardly increased. Even though the cultural exchange between people in India and Africa in some ways involves groups that are discriminated against in both contexts, it still contains many characteristics of an unbalanced North-South exchange. No period is characterised by the incorporation of any aspects of black culture into the making of our national self-image in the way that, for example, the USA and Europe are reference points for the new middle-class intellectuals and activists in India, who often refer to them for their politics of human rights and identity. Corporate globalisation hardly encourages any horizontal exchanges of capital, goods and services between India and Africa. Many ‘Indian’ and ‘African’ people and commodities that reach each other’s shores, do so through a complex and far-reaching triangulation, starting their journeys in the South to reach the North and, from there, often with an increased status that a passage to the North implies, moving on again to the South. In these contexts, the Summit’s Delhi Declaration and the Africa-India Framework for Cooperation, India’s decision to expand unilateral duty free and preferential market access for exports from all 50 Least Developed Countries, 34 of which are in Africa, an offer of lines of credit amounting to $5.4 billion to African States, coupled with several events before or concurrent with the Summit, like the India-Africa Editors Conference, joint performances by Indian and African cultural troupes, a business conclave and others, should act like sparks in the ongoing debate about how to engage with Africa today. It should also be a critical exercise in the context of the controversial Chinese expeditions in Africa, the almost-fiasco of the G8 commitments towards Africa in 2005, the forgotten Report of the Commission for Africa set up by the British prime minister, and the dismal performance of the high profile Make Poverty History campaign. While Indian and African States explore new opportunities for trade market and prosperity, the globalisation of ideas and practices is commensurate with further democratisation of politics in India and Africa since the 1980s. Hitherto marginalised populations and groups in both the continents have sought more voice and participation in the affairs of the States. The ‘developmentalist’ side of decolonisation at the time of Bandung, and the clear and conscious desire of Indian-African States to ‘catch up’ with the west is highly contested today through different means and contexts. Further, the ‘south-south solidarity,’, as it is called in the Delhi Declaration, cannot afford to miss contemporary burning issues in Africa like the MNCs or corporate accountability, or focusing India Africa partnership in specific areas of struggles against poverty; debt relief, aid and policy conditionality; HIV/AIDS, intellectual property rights and WTO, privatisation of natural resources, and war, conflict and hegemony. India and Africa reach to each other through a variety of vehicles and agents, which have changed, especially over the last few decades. Both the State and the social scientists contributed immensely in the first and second periods to the discourse making and agenda setting. However, today there is less State and more market than a generation ago, more commerce and cacophony. There are more novelties. Also, the networks formed by some universities, academic institutions and NGOs have contributed to the import and distribution throughout India-Africa of a number of expressions of India-Africa solidarity, such as ‘empowerment’ and more recently, ‘black is beautiful.’ As a concrete follow-up to the recent State confluence, the question is how do we develop diverse agents, vehicles and circuits within political and civil society? Ironically, African-born population and products are almost negligible in India today. You might have heard of, probably even cavorted to, salsa, hip-hop and rap, but you have no chance of discovering the black dances like the Dogon or the Manjini, in this country. We see TV channels broadcasting some ‘black’ series, but almost all of them are US-produced and sometimes we get only a limited number of ‘black-exploitation movies.’ People and objects, lexicon and music beats are defined as African by superficial association and similarity rather than through respectful interaction, careful research and regular exposure, which is quite scarce. Amidst this, the India-Africa Summit and other initiatives signify major shifts in the use of ‘Africa’ in India. The ‘poverty’ and ‘primitiveness’ of Africa have given way to ‘partnership’ and ‘cooperation’ with Africa. This shift should be banked upon not only by the market, but also in peoples’ aspirations and needs in an emerging new Africa, which is more varied and democratically vibrant than ever. Mukul Sharma is the Director of Amnesty International in India. This piece was original published on InfoChange India.